This article examines why Australia has taken a tough stance on ‘boat people’, through an analysis of the Malaysian People Swap response. The findings support the view that Australia’s asylum seeker policy agenda is driven by populism, wedge politics and a culture of control. The article further argues that these political pressures, in sum, hold numerous negative implications for the tone of Australia’s political debate, the quality of policy formulation, as well as for asylum seekers and refugees themselves. 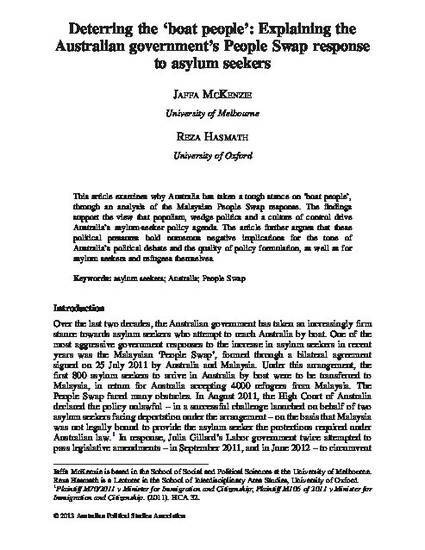 McKenzie, J. and Hasmath, R. (2013) “Deterring the ‘Boat People’: Explaining the Australian Government's People Swap Response to Asylum Seekers”, Australian Journal of Political Science 48(4): 417-430.